Implements – pyramid flexible silicon mold * Prepare a flexible silicon pyramid mold (we used a 15 cavity mold with .68 oz cavities) by spraying lightly with cooking spray, or wiping each mold cavity with a little vegetable oil. Follow by wiping each mold cavity with a clean paper towel. This method will leave the slightest reside which will aid in un-molding the gelatin without affecting the taste or appearance of your gelatin. Place the mold on a stable, movable flat surface, such as a cookie sheet or cooling rack (make sure the pan or rack fits into your refrigerator). Pour coffee/espresso into small saucepan. Sprinkle with gelatin and allow to soak for a minute or two. Heat over very low heat, stirring constantly, until gelatin is dissolved (about 5 minutes). Remove from heat, and add the vodkas and coffee-flavored liqueur, stirring well to combine. Taste and add agave nectar/simple syrup, if desired. If making dual-layer jello shots, divide the jello shot mixture equally into two bowls. Add 1-2 tablespoons of Irish cream liqueur to one of the bowls. 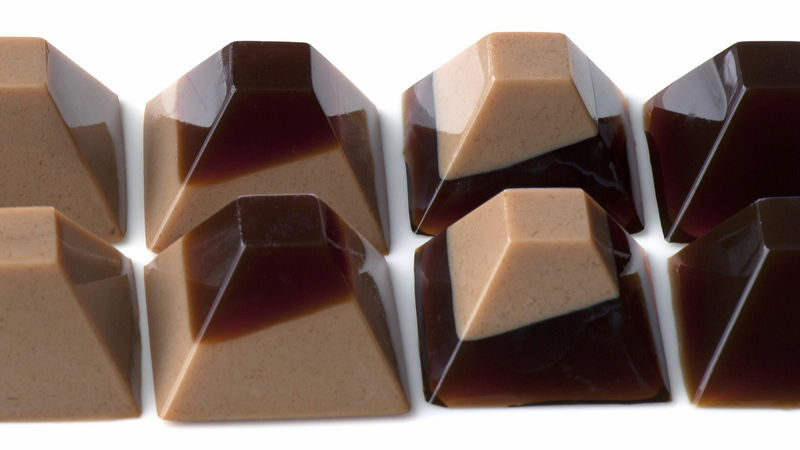 Spoon a teaspoon of the Irish cream liqueur mixture into four of the mold cavities, then spoon a teaspoon of the espresso jello shot mixture into four additional cavities. Refrigerate until set, about 30 minutes, inverting the mold on one end to create an angled layer. When set, remove from refrigerator and fill with the alternate jello shot mixture. You will have seven mold cavities remaining, fill these with the remaining espresso and the Irish crème liqueur mixtures.